The term “Swiss Army Knife” was coined by United States soldiers after WWII. The soldiers had trouble pronouncing the original name of “Schweizer Offiziersmesser” (Swiss Officer’s Knife) and thus began calling the multi-tool a “Swiss Army Knife”. 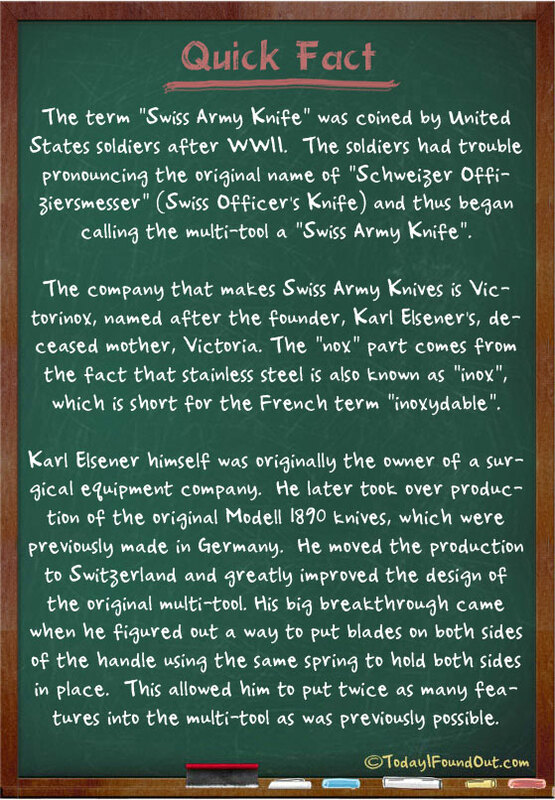 The company that makes Swiss Army Knives is Victorinox, named after the founder, Karl Elsener’s, deceased mother, Victoria. The “nox” part comes from the fact that stainless steel is also known as “inox”, which is short for the French term “inoxydable”. Karl Elsener himself was originally the owner of a surgical equipment company. He later took over production of the original Modell 1890 knives, which were previously made in Germany. He moved the production to Switzerland and greatly improved the design of the original multi-tool. His big breakthrough came when he figured out a way to put blades on both sides of the handle using the same spring to hold both sides in place. This allowed him to put twice as many features into the multi-tool as was previously possible.